Before they leave for Christmas break, Senate Democrats are trying to pass a massive bill to fund the government through the end of the current fiscal year, which began October 1st. Twelve separate spending measures have been wrapped into the "omnibus" bill -- as well as language that would keep the Obama administration from holding trials for Guantanamo Bay prison detainees or detaining them on U.S. soil. The administration wants to try and move the detainees as part of its effort to close the controversial facility. President Obama has already missed his deadline to close the facility within one year of taking office. The 1,900-plus-page bill includes language prohibiting the Justice Department from acquiring a prison facility to incarcerate or detain current Guantanamo Bay detainees in the United States. Congress is also attempting to use its power of the purse to curb the White House's policy goals: the omnibus bill does not include the funding requested by the administration for first year costs of criminal trials for some former Guantanamo detainees. A Senate summary of the bill says the funding was left out "because the Administration's plan for these trials is still undefined." 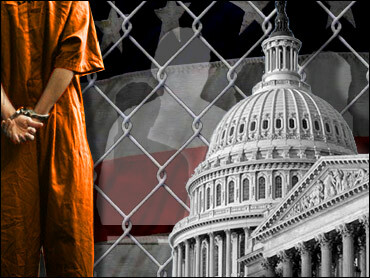 The House passed a measure last week barring the transfer of Guantanamo Bay prison detainees to the United States. Attorney General Eric Holder subsequently sent a letter to Senate leaders urging them to abandon the legislation. "In order to protect the American people as effectively as possible, we must be in a position to use every lawful instrument of national power to ensure that terrorists are brought to justice and can no longer threaten American lives," Holder wrote. Decisions about when and where to try terrorist suspects should be determined on an individual basis, Holder said, and preventing that would have serious implications the impartiality of the justice system. "It would be a mistake to tie the hands of the President and his national security advisers now," he said. The legislation comes after the trial of Ahmed Ghailani, the first Guantanamo detainee to be tried in civilian court. Ghailani was convicted of one conspiracy charge but acquitted of more than 280 other charges related to the 1998 bombings of U.S. embassies in Africa. While Ghailani faces 20 years to life in prison, some called the verdict proof that the administration's plans to try alleged terrorists in federal courts risks letting them go free. Senate Democrats are rounding up votes for the omnibus bill, which would fund the federal government through Sept. 30, 2011, and say they are hopeful they can get the 60 votes needed to overcome a filibuster. Some Senate Republicans, however, are expressing their strong reservations with the measure. Republican Sen. John Cornyn of Texas blasted his Democratic colleagues for combining so many spending bills "before anyone can read them." "This political end-around reveals just how quickly my colleagues across the aisle have already forgotten the voters' message in November, and I urge Senate Democrats to keep the wishes of the American people in mind as they consider this move," he said. Republican Sen. Jim DeMint of South Carolina, meanwhile, criticized the bill for its thousands of pet projects, known as earmarks, which were added by Democratic and GOP senators alike (despite a pledge by Republicans to give up such projects next year). "Americans loudly demanded an end to the runaway spending, but Democrats are intent on raiding every taxpayer dollar that they can grab from the Treasury on their way out of power," DeMint said in a statement. DeMint said he and other Republicans will force Democrats to read the bill on the Senate floor. Incoming Republican House speaker John Boehner, meanwhile, is calling on Mr. Obama to veto the measure if it passes. "If President Obama is truly serious about ending earmarks, he should oppose Senate Democrats' pork-laden omnibus spending bill and announce he will veto it if necessary," he said.